Audio Spectrum Analyzer turns your phone or tablet into an audio spectrum analyzer. 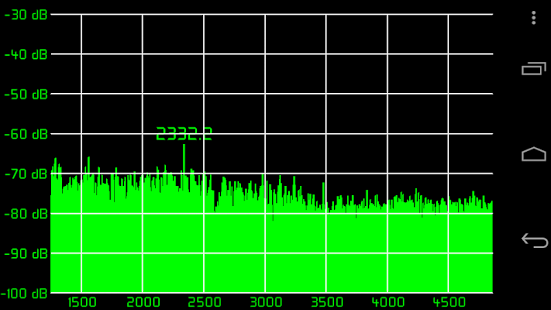 Frequencies up to 20 kHz can be displayed, either with a linear or logarithmic frequency axis. You can control the displayed frequency span, as well as the FFT size, from 1024 to 262144 bins. The larger the FFT size, the longer time between updates, but the higher the frequency resolution. Logarithmic display is available, and the graph fill mode can be turned on and off. Up to five frequency markers can also be displayed.